It’s happened to me again: someone on LinkedIn that I have never heard of has sent me a short impersonal email suggesting we do business together. I get these kind of unwanted emails in my LinkedIn inbox almost every day. Most days I just ignore them, but today I replied back saying that I wouldn’t interact and do business with someone I had just accepted as a connection on LinkedIn and I also suggested that they should work on their online relationship building skills. I then got a reply saying that my response was too direct and the person in question got so offended that he blocked me from his LinkedIn account. Yes, it was a direct message but it is hard not to be direct when you have received a very direct sales message yourself from someone you do not know and have no previous relationship or history with. If I agree to connect with a new person online I don’t then want them to try and sell me something the following day. If a person I don’t know sends me a friendly message that’s absolutely fine. I would really appreciate that. If you send me a direct sales message (which can also be called anti-social spam) and I send a direct reply please don’t tell me that I’m too direct – I am probably only saying what everyone else is thinking. During my time as a digital marketer at a large publisher I attended hours of legal training by our in-house lawyers and digital marketing law experts. Sending a direct sales message to someone you have no previous relationship with is illegal. You may have heard that you can’t add someone’s email address to your email newsletter system without their consent. For me the unwelcome sales messages I get on LinkedIn all feel and smell the same. I am not a lawyer but I am sure a lawyer with a background in communications could give a full explanation of this situation. If you are such a lawyer please share your thoughts. If you want to sell to people on LinkedIn why not share a nice, friendly message in your updates on a regular basis and ask for people to contact you if they are interested? Another way to connect via email on LinkedIn is to suggest collaborating or by sharing that you have something in common with the person you are contacting. 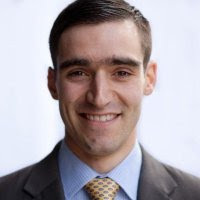 Now, please don’t get me wrong, I love LinkedIn more and more, especially now that I’ve cleaned out my connections and removed all of the connections that had only a company name, no profile picture and no description. But this sales thing is really annoying me. We should use LinkedIn in a soft way, not for the hard sell. 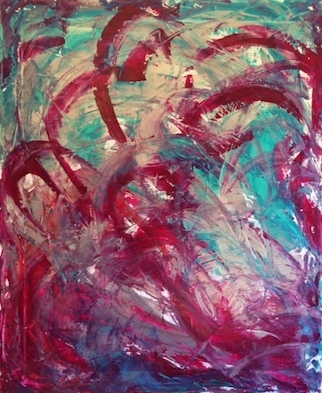 This is my latest art and when I painted it I thought about the chaos and mess that social media brings to our lives. I speak to people about social media almost every day and there is a huge confusion about social media around the world. So far I’ve not met any person from any organisations who says that it’s easy to communicate through social media and that that technology is not making them confused. These three pieces of art describes the web/technology/social media confusion that you might feel, and if you ever felt confused I can assure you that all organisations feel a bit lost. Social media and technology and new ways to communicate are affecting us a lot. At the moment 40% of all people on Earth have access to the Internet and in the next few years millions and millions more will have access. How will this influence us? What will happen with businesses? 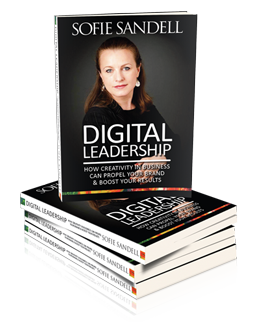 If you are a leader you must plan for an über-connected future with new creative technology. There will be nowhere to hide. Your honesty, transparency and your intentions will be scrutinised. Eid Mubarak to all my friends around the world who are celebrating the end of Ramadan. May you have had a blessed time with your family and friends. 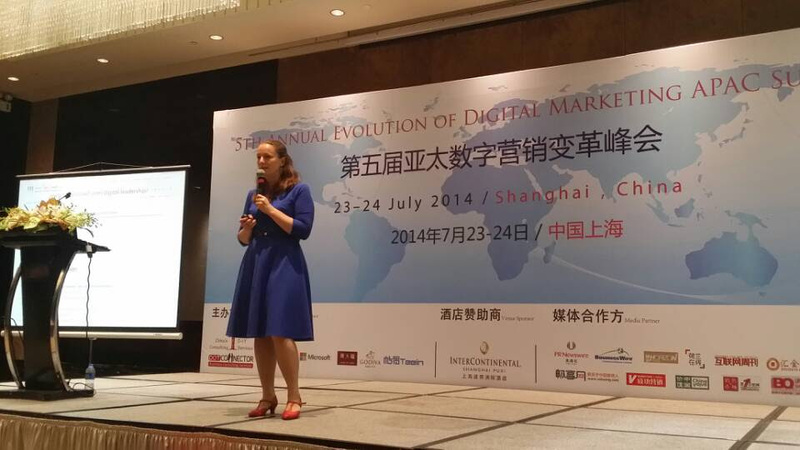 Last week I was speaking at a large digital marketing conference in Shanghai, China. It was my first time there and I was a bit nervous about how the audience would receive my content – probably all speakers get nervous when travelling to a new part of the world that you’ve never been to before. The topics I spoke about were ‘The Importance of Personal Branding Online in B2B’ and ‘Digital Leadership – How To Embrace Technology and Creativity’. Both talks went down well and I got lots of questions and feedback directly after them. I love instant feedback and great connection with the audience. China has its own ecosystem of social media. You can’t access sites such as Facebook, YouTube and Twitter. One thing that I learned was that for every new big social media network from outside China they are inventing at least ten similar networks for the Chinese market. So there are a lot of sites and platforms. The most popular social media network that people use is WeChat. It’s like a combination of WhatsApp and Facebook. Very smooth interface and super smart. It already has an e-commerce shop in it. I loved it and I connected with several people I met through it. 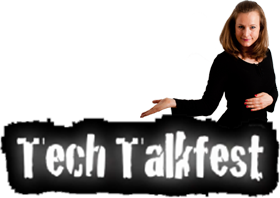 As a speaker you have to have some good videos of yourself speaking online, just to show who you are. I have a few videos on YouTube.com. When I was in China I quickly realised that all Google Apps are blocked, so nobody can watch my videos… The next thing I need to do is to join Chinese YouKu – the biggest Chinese video platform, and add my videos there. My podcast app Audioboo worked well as well, but Soundcloud didn’t work. Most normal websites were ok to access – but you never know if they might be blocked in the future. Like many entrepreneurs I am using Gmail, and of course it doesn’t work to access in China. I somehow could get access to it from my email app on my iPhone, but no Google Apps worked. I often use Google Translate, and when I could not use that at all I really missed it. To get around this you can buy a VPN key, many people do that to reach outside the Chinese internet ecosystem. To search for content online I used Yahoo.com and Bing, it’s years since I’ve used those. It worked well for me, but of course your online behaviour gets a bit interrupted when the biggest search engine is blocked. All of the websites that you access by signing in with Facebook or Twitter won’t work. I found this annoying, I definitely need to sort this out before I go back so I can access them directly with my email and password. The Chinese conference delegates had lots of questions and their problems with social media and technology are similar to what we are struggling with here in Europe. The mix of social media networks, content, communication and then add to that new technology and vast amounts of data…it all makes it complex. How do you engage your audience online? How do you create a message that anyone cares about? How can B2B use social media? How do you conquer the challenges with big data? 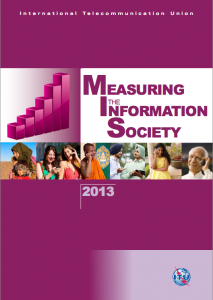 How do you interpret social media numbers? I was part of a panel discussing video marketing in B2B. This is something that many businesses need to look into and learn more about. We love visual things and we love stories, and if you are combining this into a video you will inspire your audience. Not that many people are natural video producers and directors, this is a skill you need to learn. My tips is that you should work with a professional production team who can help you tell your stories. There is no magic length of a video online, anything from a few seconds up to 10 minutes will work if you can engage and entertain your audience. I often get asked this questions and it’s like watching TV, sometimes you just get sucked into a story and can’t stop watching. One of the speakers at the conference was from Ogilvy and she showed us some interesting campaigns from Dove. Ogilvy and Dove have paired up together for over 8 years now, probably even longer in some parts of the world. This is one of the key parts of successfully developing your message and content – build a great partnership where you respect each others talents, both as the client and agency. I see a trend that more and more companies are pushing towards equipping their digital marketing teams with people who love to interpret numbers. Many marketers I know are scared of sitting down and looking in detail at what the numbers mean. They are much more comfortable managing the creative side of their brand, writing and creating stories. In marketing there will be more analytical hybrid roles in the future, and there is already a big need for these kind of skills. People who are mathematicians and statisticians will be part of the marketing team and interpret what all numbers mean. Sort of like a modern digital marketing accountant. Numbers are a huge asset for us and also big part of our language and culture. But if we don’t know how to interpret them we are not going to use the knowledge that the numbers are telling us. Another mega problem in social media is ‘how to share your message with integrity’. With integrity I mean being honest and having good intentions with what you are saying and doing. So many brands are not sure about who they are, what they stand for and who their audience really is. You need dedicated leaders who care deeply to get this right. Brands with no opinions and no stand point feel meaningless to many people. We want to know who you really are, and in the world of social media there is not much you can hide as a brand. Gerhard Bley thought that if they can’t act in a balanced ‘adult’ way and make decisions based on good intentions and empathy they can never be great leaders. A pretty impressive thing to do. I am sure they will write some interesting case studies about this in the future. The question ‘Who are you?’ is scary to answer, and it takes a lot of time for formulate this for all brands. Without knowing who you are and what you stand for it’s hard to lead. 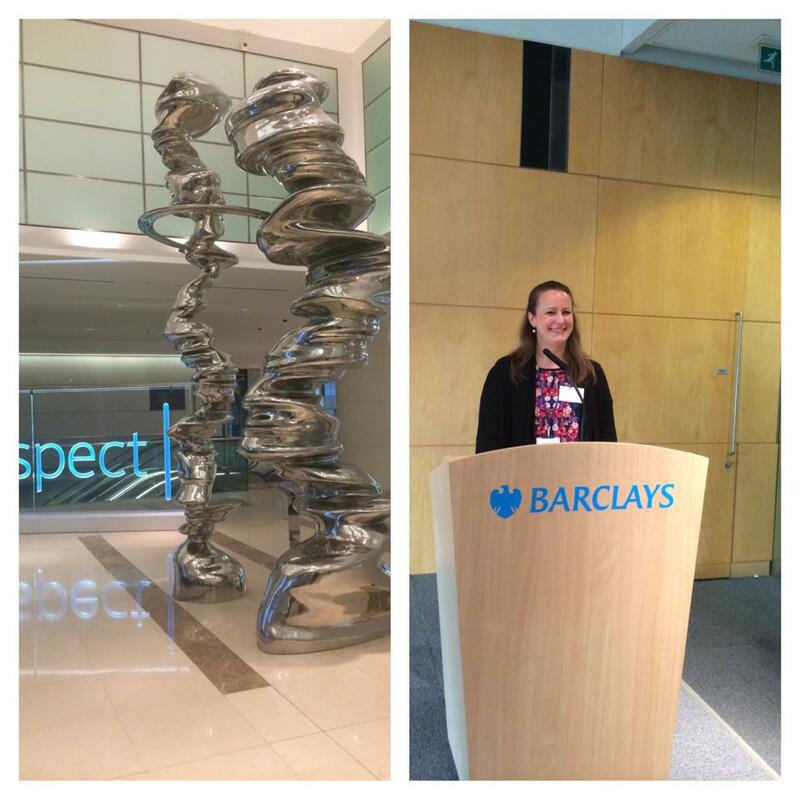 Last week I was part of a panel at an event at Barclays in London. The theme was ‘How the digital revolution is shaping Africa’. 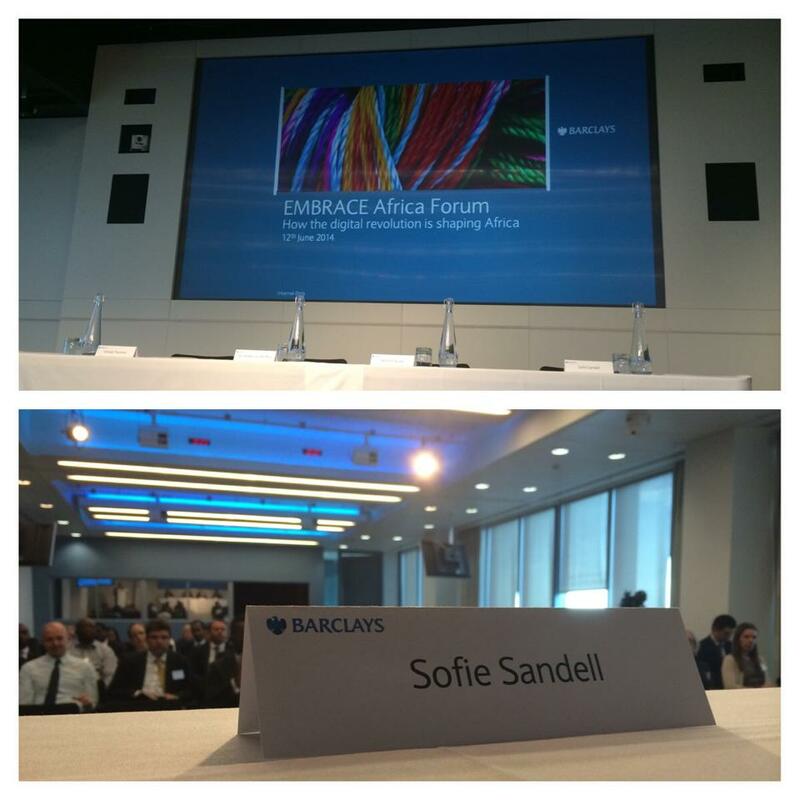 It was a great event organised by the Africa Forum at Barclays. 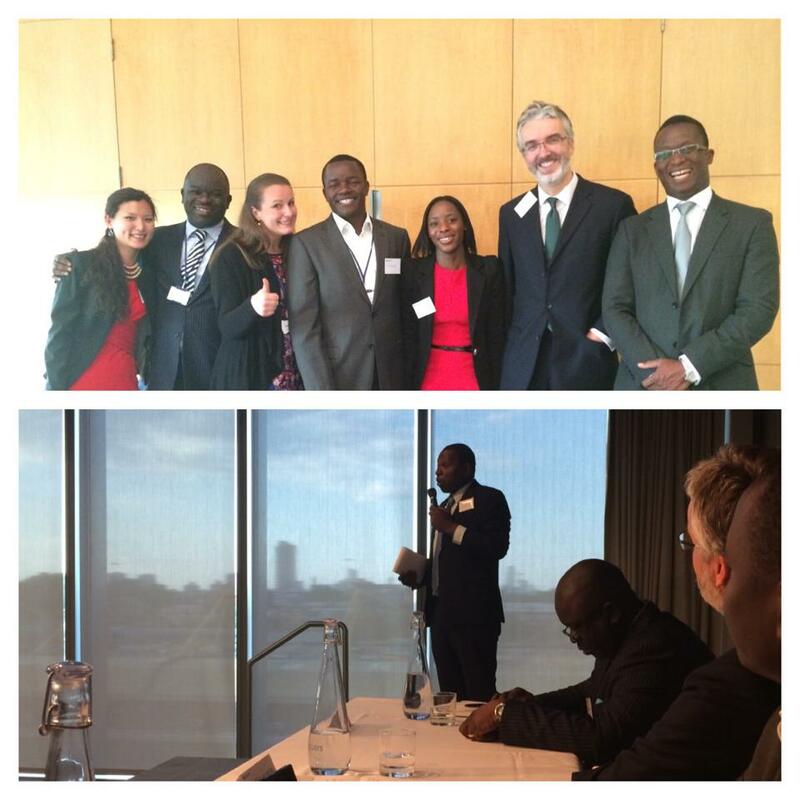 The forum was set up to share more insights about Africa for people based in the UK. Barclays has been around for over 100 years in Africa, and are present in more than 19 African countries. The World Wide Web has been around for over 25 years now, and the access to the internet is uneven. In developed countries the access is high, in developing countries it’s low. Even though the internet penetration is high in the UK there are 6.4 million people in the UK (2011) who have never used the internet. Here is an overview of the countries with the highest and lowest internet penetration per 100 people. The growth of the internet and digital media has been huge in Africa in the last decade and we can expect the African countries to leapfrog and catch up quickly. The lack of a reliable infrastructure in Africa is stopping digital development. To make sustainable investments Africa need access to electricity 24/7. Now the access is not reliable in most counties and many households and businesses must have backup electricity generators. Without access to the internet countries feel rejected from the rest of the world. 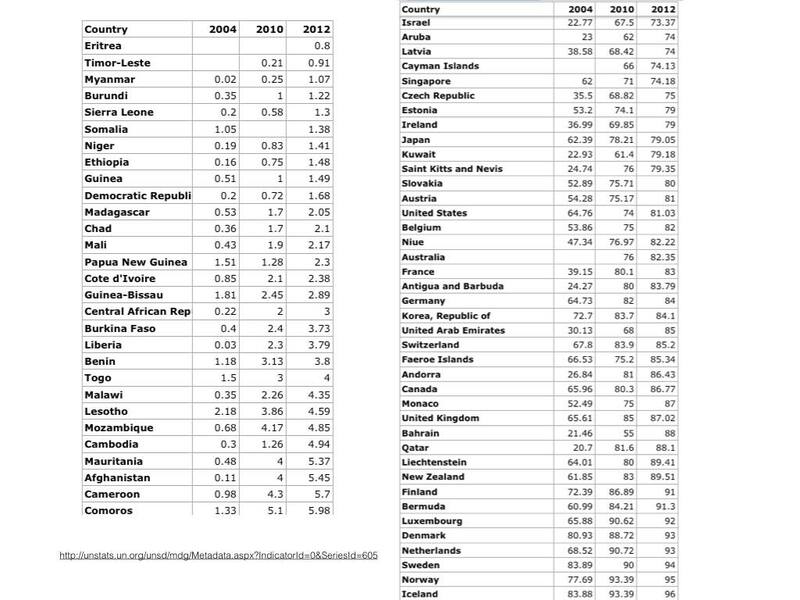 How much shall the developed countries push the African countries to change? Can they demand change? Action and better policies will help. 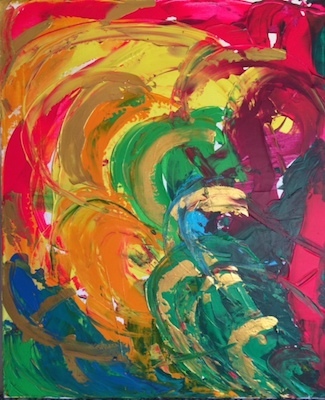 No education and no knowledge sharing means standing still. No investments means one step back. Where will Africa’s leaders bring their people? And the the BIG question: Who will lead the change? Are you fluent in the digital language? If you are not fluent in the digital language you are going to have huge problems using the internet and social media as an innovative platform. Understanding whether you need to be on certain platforms and how connections and content may help you move forward is vital. Well, yes. Connecting with people you know on Facebook will help you to understand the bigger picture of how you build relationships and trust and how you collaborate and interact online. One man I met on one of my flights said he would never use Facebook or similar social media networks because he had heard that people don’t share interesting posts – too many selfies and too much private communication and details that should have remained private. 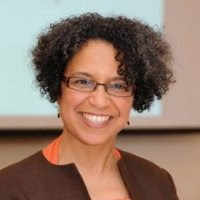 People are people, they behave and interact differently both online and in real life – and you decide who you would like to connect with and let into your network. If anyone annoys you, you can always mute them by turning off notifications from them so their comments do not appear on your Facebook feed. 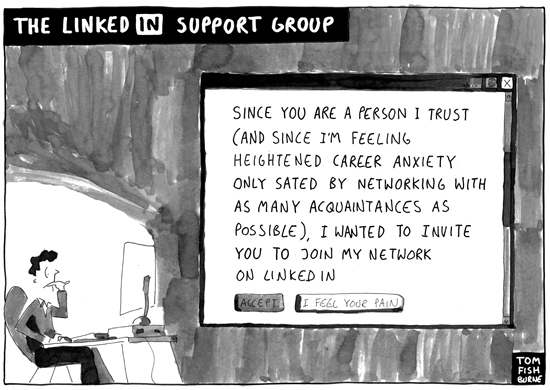 For me it took a long time before I opened up my LinkedIn network. I felt a bit uncomfortable showing my colleagues where I studied and so on. It took a while but eventually I got over it and connected with the people I work with. It was strange that I was worried about this. I have many colleagues from my last corporate job as Facebook friends and it’s great to have them there. I hope they will be in my network forever. Right now there are two digital giants based in California: Google and Facebook. They are huge and we use them a lot. There are about 7.2 billion people on earth and Larry Page, the founder of Google, claims that about 35% of us have access to the internet, which amounts to a staggering 2.5 billion people. Of all these people about 1.8 billion use social media networks. If you refuse to get a Facebook account because you think people share stupid things on Facebook I think you need to reconsider your decision. To learn the digital language you have to get involved and participate in online discussions. You have to be an active contributor to understand how online participation can help you. Would you consider not using Google anymore? You had to get used to that too. Sometimes I believe that people who are afraid of building connections online are a bit scared of new relationships and what they will bring. What do you think? Just get involved. Be active. Contribute and share. Best wishes and big thanks to you! 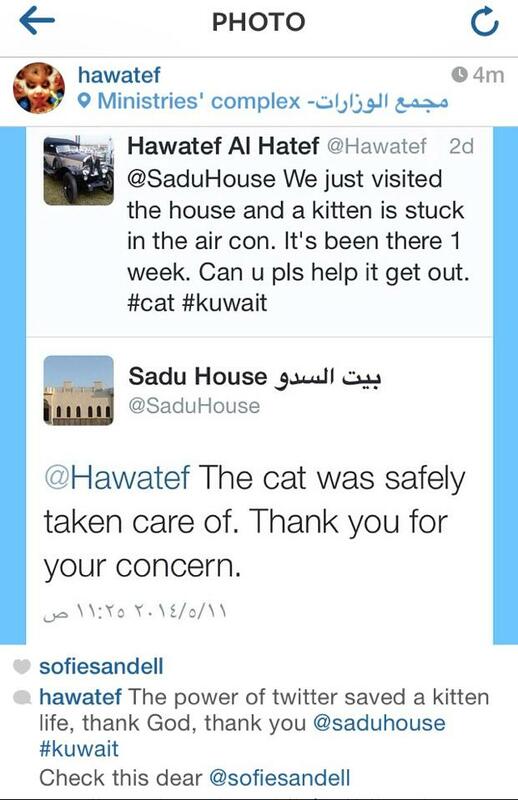 When I was in Kuwait in May to speak at the 3rd Arabian Social Media Forum about social media I was part of the team that saved a kitten’s life thanks to Twitter. After the conference my new Kuwaiti friend Safaa took me to a museum to show me how people used to live in Kuwait. In one of the rooms we heard a kitten stuck inside a wall. It turned out that it had jumped down into the air-conditioning system on the roof and couldn’t get out again. The staff in the museum told us that they had tried to help it but they needed to open up the wall to get it out and to for this they needed management’s permission. On our way back home we tweeted the museum and within a couple of days they had saved the kitten. Thanks, Twitter, for making it so easy for us to connect. This trip was my first visit to an Arab country and I was extremely surprised by how people in Kuwait use social media. I made three observations: People are as addicted to their smartphones in Kuwait as they are in the rest of the world; Kuwaiti people are not yet shopping online; and Instagram is at the heart of social media activity in the country. The social media network that matters most in Kuwait is thus Instagram, but Twitter is also widely used. During my stay I visited five shopping malls which all housed big brands, especially luxury brands. One of the larger malls, Grand Avenue even has an IKEA in it. A big part of Kuwaiti social life is spent in shopping malls. You go to shopping malls to meet friends, visit restaurants, go to the cinema, shop and cool down from the heat outside. How we explore online opportunities has a lot to do with what happens in our culture and society. Social media in Kuwait is driven by sharing photos online and I think that this activity may be connected to spending so much time in malls and the desire to share what you like to look at and what you buy. You want to show off great photos to enhance your personal brand (status). If you just bought a new handbag you want everyone to see it. When someone posts anything on Instagram in Kuwait they immediately get a pile of likes, more than I have ever seen for Instagram posts in other countries. Just search for #Kuwait #Q8 on Instagram and you’ll see the huge number of hashtags. I didn’t meet anyone who wasn’t active on Twitter and people use Twitter to stay up-to-date with what’s happening in politics. The government and all of its departments are also very active online. You can see a collection of some of this activity here. I can also add that during the summer months it gets very hot in Kuwait, up to 50°C, so you don’t want to be anywhere that isn’t air-conditioned. When I was there the temperature was around 40°C, so I can understand why the cat wanted to chill down in the air-conditioning system, and why everyone was hanging out in shopping malls. During my visit I researched some tourist attractions online and I was disappointed to find that the website for Kuwait Towers looks as though it was designed a decade ago. A Kuwaiti told me that this was probably the case. This sadly does not reflect well on Kuwait in terms of it being a forward-thinking and digital-savvy country. Most people I met were very quick at picking up trends and the increase in web use in the country has been huge over the last few years. I would expect to see people in Kuwait using the web in new ways in the near future. I met lovely people in Kuwait and they were very kind to me. Social media has and will play an import part in how all societies move forward. One speaker, Nasser Al-Mujaibel from Kuwait University, said that people in Saudi Arabia who watch YouTube are much more open to change and new ideas than those who don’t. Could this be true worldwide? Is YouTube broadening people’s world views? Probably yes! One thing that surprised me was the lack of e-commerce in Kuwait. At the forum I listened to Mohammad Hijazi, a social media consultant from Lebanon, and he said that people in Arab countries are still very wary of shopping online. This is connected to the fact that the World Wide Web came to this region a bit later than it did to many other countries. It takes time for people to change their shopping behaviour. In the Middle East, if you want to buy anything from Amazon you first have to get yourself a US or UK postal address and ship your order there. Several people I met who use Amazon had a deal with DHL in which they had a US or UK PO box and DHL would pick up the package from this PO box and then deliver the Amazon order to the purchaser in Kuwait. PayPal is not widely used and to withdraw your money from a PayPal account in Kuwait you need a US bank account. It’s like in Europe where we are still hesitating about whether we should buy anything using our mobile phones while in Japan it’s very common for people to regularly shop using their mobiles. Instagram is probably the biggest e-commerce channel in Kuwait. Brands just add a website or a phone number under a post and then people can get in touch and buy the items being promoted. Ivan Zeljkovic – Digital Video – The Death of TV Advertising? Hi, this is Sofie Sandell blogging from Kuwait. 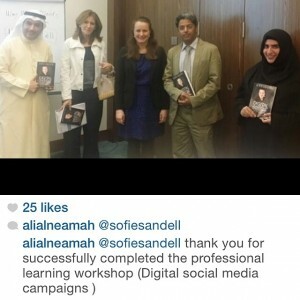 I have been teaching a workshop in social media campaigns all day. 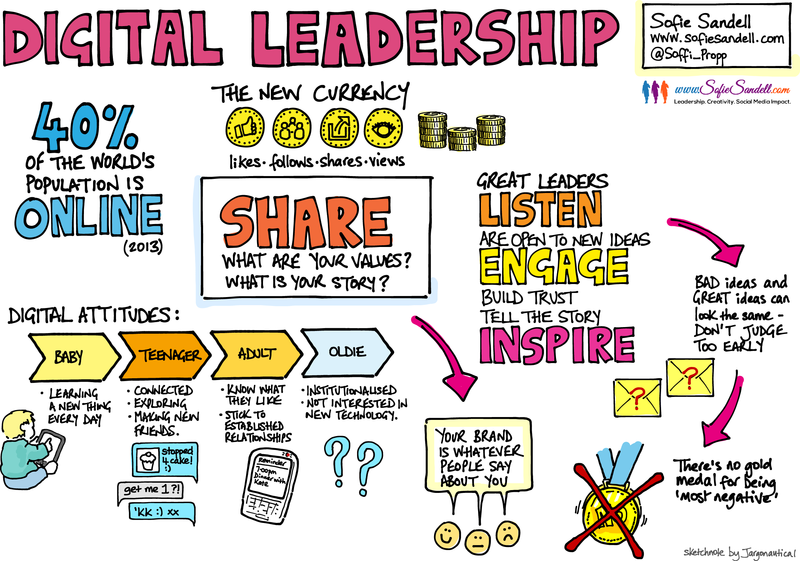 It’s very interesting to see the similar problems that social media brings into organisations. When you introduce social media in an organisation that has been around for a while, say over 15-20 the years, you often have a business cultural problem. The way people act says a lot, this is the business cultural. And if they are feeling that social media is not for them they will act that way as well. It’s often this kind of businesses that I am helping and coaching and social media brings with it a bit of cultural change. It’s very easy to employ someone to do social media, but it’s always hard to get the organisation to “get it” – it takes time. The structural change that social media brings is often new positions, new responsibilities, and new expectations. But if the organisation has a very slow culture change system it will take a long time and joint effort to see the effect of social media. Social media is a way to share new information and knowledge, connect people internally, and connect better with external partners. And if you’re not really sure who you are trying to connect with then you will get stuck. I have noticed that this is a problem that organisations have all over the world, and it has to do with the element of including social media into the business strategy. You must get it right here to get it to work. Many organisations are copying ideas and tactics from other similar businesses. This might work for a simple actions, such as start tweeting or getting a YouTube channel. But to get this method of “observing others and copy” to work you have to know your own business, strategy and platforms by heart. If you try to copy someone else’s strategy not knowing yourself good enough, you are going to have problems. Problems that often expresses itself as an disengaged audience. If you are not sure about who you are and what you stand for it’s hard to find common ground when connecting with others. Social media is about getting people to feel connected to your brand. 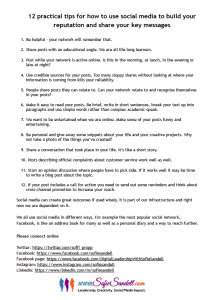 To copy ten quick steps from a book or course and kick off your social media strategy will not work either. What you’re saying about yourself in social media is also an extension of what is going on in your organisation. 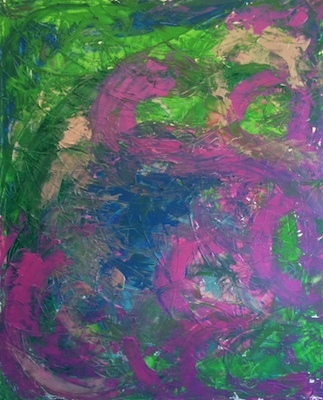 In many ways you will show your ability to adopt new ideas and your ability to innovate by what you do and say online. Companies that are denying that their audience are communicating in the digital language are not planning ahead for success, and potential partners and investors will see that. 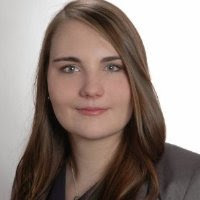 Hi this is Sofie Sandell, welcome to my podcast and now also transcribed blog post. Today I’m going to share some of my thoughts about the hotel industry. I met up with my mentor Mats Östblom a while ago. He’s been in the hotel industry for over 25 years and he is the hotel director for one of the hotels in my home city Gothenburg in Sweden. We spoke about social media, hotels, how things have changed and what people do today when they’re traveling. One thing I’ve noticed is that my network is great at sharing pics from their trips on Facebook. When I look back at myself what I did when I was a kid I travelled with my parents and in the summers we often went abroad. Before I travelled I told my friends “okay we’re going abroad we’re going to do this and do that, and let’s see what’s happening, I will let you know when I’m back home” and when I was away we explored, we went to different places and I spent an afternoon just writing postcards to my friends about where we were and what we had been up to. When I was back home I called my friends: ”I’m back now, I will show you some pictures from the trip later”. When I had been developing my pictures a few weeks later I showed them my photos. Now when I’m traveling I am likely to update what’s going on in real-time. Once I almost missed my flight due to that the Gatwick Express train was almost one hour late. I panicked and updated my Facebook status about that in real time, I got some compassion comments and felt better. Today you update of what is happening, about the people you meet, what people are saying, you take a cute pictures and share videos. And when you get back home you have already shared your trip with your friends. It’s exactly what I did as a child, but it took longer to do it. The social behavior between people are still the same. My mentor and I continued to discuss what has happened in the hotel industry. When people now book a hotel they’re not even sure whether they are on the hotel website or if it is a website that is gathering all hotels in one place. People think they’re going to the hotel website. In reality they go into one of these enormous websites such as hotels.com, Tripadvisors, Expedia and book from there. All these travel sites have made the whole hotel industry a bit worried. And they should be I think. Many hotel websites and brands may not be that social as they should be. Take a look at hotel websites they are not that innovative at all. They look the same, feel the same… Some of them are not even proud of their brand story and you have no idea who they really are. They are not that different from each other, they say the same things as their competitors do. I think that hotels need to shape up their social media profiles and be a bit more social and have more social conversations with their audience. They need to communicate their brand values better and show more interest in their audience. I’ve looked at many London hotels’ websites and the more famous a hotel is the more history and background information you can find on the site. We love that kind of information. I often share some book tips in my social media masterclasses and here I’ve collects some books that I enjoyed reading.